Take any ordinary candle (the larger the better) and place a heavy duty rubber band around it. 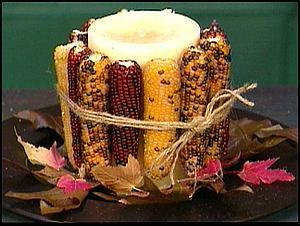 Then, simply tuck in mini Indian corns around the candle until its surrounded. Tie with jute twine or a raffia bow, cut the rubber band away. How about substituting corn husks and adding berries to the raffia bow. 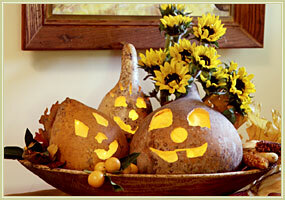 Use basic tools such as a drill to create these silly faces on the fronts of dried gourds. Cut a large hole in the back to nestle in a tealight candle. Group several together for a fun and whimsical show! 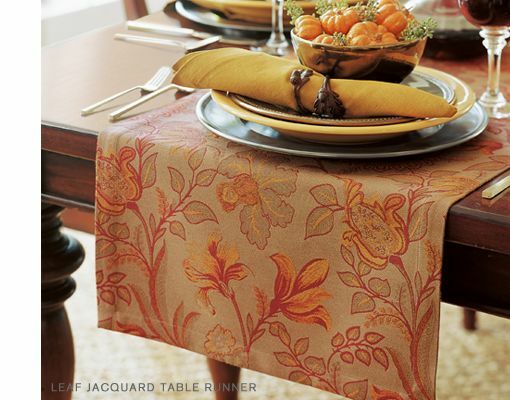 Instead of individual placemats, how about using two or more table runners. Choose longer runners which hang over the edge. Use matching runners and coordinating napkins. In a simmering pot or an old saucepan on the stove(*), add 2 cups Apple juice, 3-4 small cinnamon sticks, a generous handful of whole cloves, and 2-3 bay leaves. If you have an dried orange zest, add a few teaspoons. Allow to simmer on very low. The fragrance will waft throughout your home in a very warm and welcoming scent. One "recipe" lasts about 2 weeks. Add more apple juice, as needed. * Please use caution when leaving any simmering pot unattended. Simmering potpourri pots are recommended, if available. Use an old pot for stovetop use, as this may stain the inside.